Published by the UK Microwave Group(UKuG)and edited by Peter Day, G3PHO. For over two decades it was formally published as the Microwave Newsletter by the Radio Society of Great Britain. Scatterpoint is now the official newsletter for members of the UK Microwave Group (UKuG). To receive the newsletter you must become a member of the Group (worldwide membership). Ten issues a year. Full subscription details are available from the Group at their website : www.microwavers.org . The newsletter is available in paper, printed format or emailed directly to UKuG members as an Acrobat PDF document. The Newletter is usually 20 pages in length and printed in black and white. It contains up-to-date news of microwave events, contests, component and equipment availability, for sale & wanted advertisements and technical articles. It is published around the 20th of the month and, because the deadline for reader input is the first weekend of the same month, the newsletter is perhaps the most up-to-date source of microwave news other than the Internet! The Newsletter runs Operating Ladders covering all bands from 1.3GHz up, on both an annual and all-time basis. 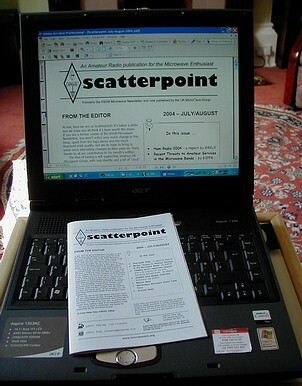 Scatterpoint Microwave Newsletter is read in all corners of the globe! Many of the technical articles have not appeared in print anywhere else. They are of a high standard, often by well-known microwavers such as W1GHZ,WA1ZMS, G3WDG, G4DDK and G4JNT. While there is an obvious UK bias, the Newsletter has something for everyone, wherever they live. Many of our subscribers live outside the UK. CONTACT THE UK MICROWAVE GROUP TODAY FOR DETAILS OF SCATTERPOINT !